Lifecycle service orchestration (LSO) is a key enabler to deliver Network as a Service as defined in the MEF’s Third Network vision. The objective of the Third Network is to provide an on-demand cloud-centric experience with unprecedented levels of user control over the network’s capabilities. Such capabilities are orchestrated between physical and virtual service endpoints across multiple networks and technology domains. 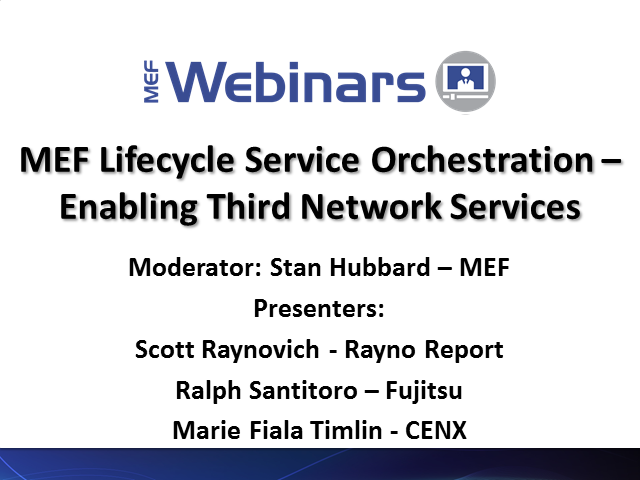 This webinar will discuss the MEF work to define the complete service lifecycle requirements to deliver Network as a Service from ordering through service activation including supporting APIs. We also will share highlights from a joint survey conducted by the MEF and the Rayno Report that (1) benchmarks where service providers are in terms of evolving data service portfolios toward more dynamic solutions and (2) sheds light on network operator views about how lifecycle service orchestration can be applied to overcome operational support system (OSS) challenges as they transition to SDN and NFV-enabled networks.